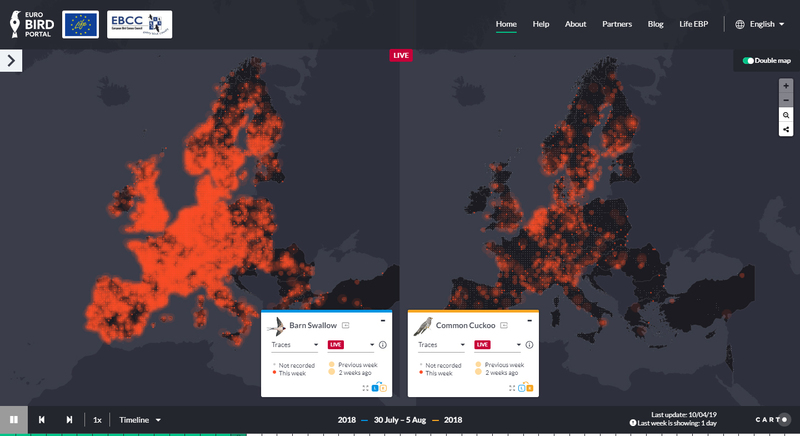 EuroBirdPortal LIVE – a free, web-based tool that provides a fascinating insight into the movements across Europe – has been launched this week. The portal allows the user to watch the northward migration of some 105 species, including Common Cuckoo and Swallow, via a live viewing programme. Animated maps are updated daily based on roughly 120,000 observations from birders across the region. Some 105 species, including familar summer visitors such as Common Cuckoo and Swallow, can be tracked with daily updates (EBP). Birders submitting their observations to BirdTrack will be contributing to this exciting project and, over the course of a year, around 45 million new observations are added, providing an unprecedented near real-time view of the movements of migrants as they arrive in Europe from further south and move north with the progression of spring. Gabriel Gargallo, EuroBirdPortal (EBP) project coordinator, said: "With the huge improvements in terms of coverage, data quality and connectivity accomplished during the last three years thanks to the EU LIFE grant, the EBP project has made a big step forward. "Now we have better data, vital to properly understand the seasonal patterns of bird distribution in Europe and their changes over time, and it is readily available, providing unique opportunities to develop novel applications of conservation and management concern (for example, predicting wildfowl movements due to cold spells or improving the surveillance of avian-borne diseases). "But all this would not be possible without the more than 120,000 volunteer birdwatchers regularly sharing their observations with the different online portals. The LIVE version of the EBP viewer recognises their vital role in the project and showcases how such individual and local contributions can be nicely summed up to help unravel the large-scale seasonal distributional patterns of our birds." Scott Mayson, BirdTrack Organiser at BTO, added: "It is great to see the observations of birdwatchers contributing to this amazing project. I have always wanted to be able to follow a bird such as a Swallow as it migrates and now I can. This is citizen science at its very best." You can follow developments at eurobirdportal.org.